Social media was a platform to share updates and prayer requests. Keith Nano had a strong faith but was still battered by fear at times. “I was full of hope and faith, and yet I was frightened.” Fear is an opportunity for faith to flourish as we look for the light in the dark. Watching his son fight for his life gave Keith Nano a feeling of helplessness. “Sometimes providing encouragement is all a father can do.” Keith Nano prayed, he sang worship songs over his son and he read scripture to him. His faith was palpable and when God showed up Keith Nano received the peace that passes all understanding. 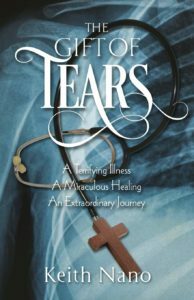 The Gift Of Tears is a remarkable story. It will encourage you as you marvel at the faith of a family taken to the edge. The book shows the mighty power of God as He works in lives today. Our God is not dead but alive and active. What He did in the past, He does in the present and He will do in the future. The Gift Of Tears was a marvellous read. I loved the inclusion of the family photos. To put faces to names is always good. Be inspired pick up The Gift Of Tears today.